Bamboo peal woven winnower, Philippines, vintage, 21" Sq.x 3" deep. 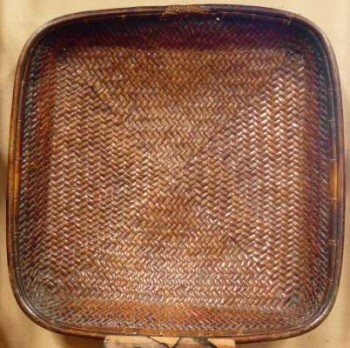 Description Hand woven bamboo peal / skin winnower called a Bilao or Ligao, depending on tribal location in the Cordilliera. This winnowing tray basket is used for drying grains (usually rice) in the sun and wind sifting and seperating the grain from the dried chaff. From the Banaue rice terrace region of northern Luzon island, Philippines. These winnowing baskets have been used for centuries. This one has been used and shows worn marks from use and hand placements and patina. Dates from the late 20th century. Footed basket measures approximately 21" square x 3" deep. These baskets are handcrafted and will very in patina, woven pattern and slightly in size.